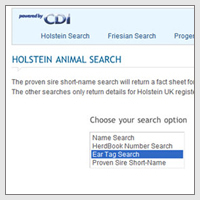 The Holstein UK search pages make it easier than ever to find out detailed information about any animal that has been registered with Holstein UK. With four different methods of searching you’ll be sure to find the information you’re looking for. Use the name search option if you know an animal’s prefix, name and serial number. The Herdbook number option if you know its herdbook number and society. The Eartag search is used for searching by the animal’s eartag. Finally, you can use the last option to search by Proven Sire Short-Name. Use the name search when you know an animal’s name and prefix. Only know part of the name or prefix? That’s fine too; input all the information you know to return a table which is full of animals whose name includes your search criteria. Add the animal's serial number to get even more precise results. 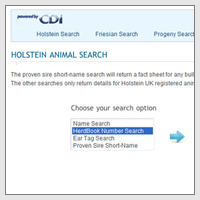 This option allows you to search for an animal using its Herdbook number. If you know an animal’s ear tag, or part of its ear tag you can use this option to search. 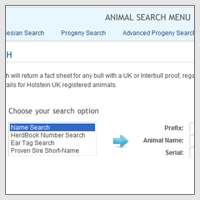 Adding the complete ear tag will return precise results, if you search for part of ear tag you’ll get a table of animal’s whose ear tags contain your search criteria. 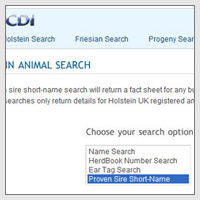 If you want to search for a sire using it’s short name then this is the option to use. Add as much of the name as you know to get a table of animal’s whose names match the search options.